Montana Log Cabin, idéal pour les familles! Vues de l'ascenseur de ski de votre fenêtre! Les superbes vues sur la forêt et les montagnes font de cette luxueuse cabane en rondins Powder Ridge une toile de fond idéale en toute saison pour toutes vos aventures dans le Montana. Situé dans un cul-de-sac tranquille juste en dessous du télésiège White Otter et à seulement quelques minutes du village de montagne, profitez d'un accès skis aux pieds sans difficulté au plus grand domaine skiable d'Amérique les pistes ne deviennent pas beaucoup plus faciles). Une solution idéale pour plusieurs familles, couples en vacances ou une escapade de groupe, cette maison de 4 chambres à coucher, offrant une superficie de 200 m², offre beaucoup d'espace bien aménagé pour se réunir ou se déployer en toute élégance. L'extérieur confortable et sobre en bois laisse place à des équipements haut de gamme, à un mobilier élégant et à des installations modernes. Doté d'une très grande chambre avec lits superposés au niveau inférieur et d'un espace bonus attenant, ce refuge en montagne offre une occupation supplémentaire et une flexibilité accrue avec des couchages introuvables dans des propriétés similaires. Une excellente option pour permettre aux adultes de se reposer un peu pendant que les enfants dorment / jouent ci-dessous. Le pont arrière à couper le souffle donne sur un monde de beauté naturelle et de vues panoramiques sur la montagne. Savourez l'air frais et les grands espaces tout en absorbant votre stress dans l'incroyable spa. Une escapade rapide depuis Lone Mountain et à seulement 45 miles de West Yellowstone, cette retraite Big Sky a tout le confort de la maison dans un paradis de montagne! Situé directement sur l'accès White Otter à côté du télésiège (la date d'ouverture prévue pour l'ascenseur White Otter est le 16 décembre, mais l'ascenseur peut ouvrir plus tôt dans la saison en fonction des conditions de neige). 14 couchages dans des lits; 15 avec canapé-lit gigogne. Jusqu'à 15 autorisés. We loved our stay at this house. The kitchen was well-stocked. The ski in ski out was pretty easy. Plenty of room for our large group. It was easy to get to and really close to the slopes. Beautiful home, well positioned for ski in/ski out. We were 8 men for our annual ski trip and this place suited us perfectly. The kitchen was well supplied with utensils and dinnerware. The hot tub was clean and hot, the beds were comfortable. Very enjoyable stay! Four wheel drive vehicle a must in the winter. We are happy to hear you had a great stay at Powder Ridge Cabin 1C Red Cloud! 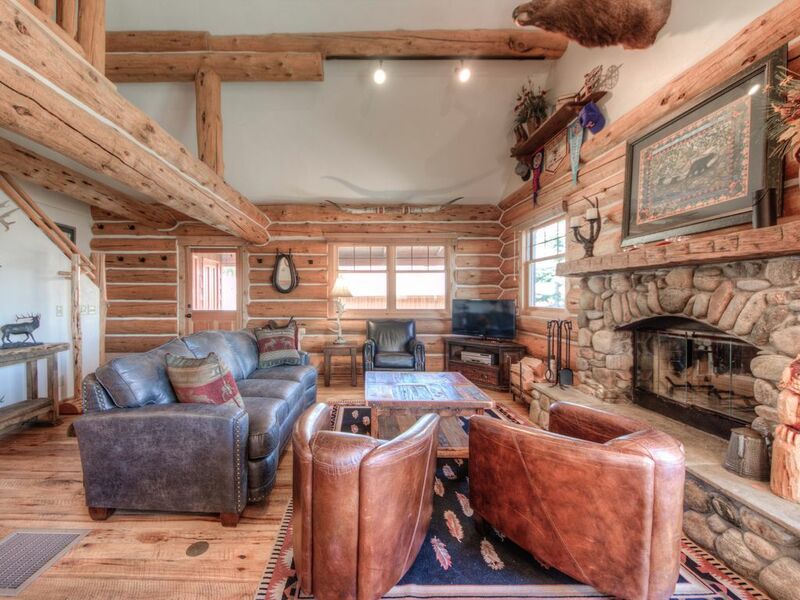 It is the perfect cabin for a guys annual ski trip with everything you might need right in the cabin, easy ski in/out access, great proximity to the Mountain Village and the private hot tub is perfect to soak in after a long day of skiing! We are so thrilled you enjoyed it and we look forward to welcoming you back to Big Sky soon! We recently rented the cabin for a long ski weekend, and the property met or exceeded all our expectations. The property was well-kept and everything was taken care of upon our arrival. The property itself provided more than enough room for the seven of us who came out to ski. The best part of the cabin is the ease of the ski in / ski out: to ski out you only need to walk a few steps off the front porch to get to the White Otter Lift, and the ski in is simple with relatively few flat areas compared to other properties. I would highly recommend this property to anyone that is looking for a good time on the slopes. We are so happy to hear you enjoyed your stay at Powder Ridge Cabin 1C Red Cloud and that we exceeded all your expectations! This is truly the perfect location for a ski vacation with easy ski in/out access and we are glad you were able to experience that! We look forward to welcoming you back to Big Sky soon! The property suited our needs perfectly. The layout is like I designed it myself. Bed for everyone and all very comfortable. The management team was wonderful to work with and attentive to our needs. Location was good, not the easiest to get back to but we figured it out. We are so happy to hear you enjoyed your stay in Powder Ridge Cabin 1C Red Cloud and that you found our team to be so friendly and attentive! It is the perfect layout for a ski vacation and we look forward to welcoming you back to Big Sky soon! The bunk room was ideal for our 3 families. It allowed all of the kids to stay together. Also, the downstairs area complete with foosball, dartboard, and television area was a great hang-out space for kids. Loved the decor and coziness of the place. Ski-in and ski-out was perfect as well. We are thrilled to hear that you enjoyed your stay at Powder Ridge Cabin 1C Red Cloud! The in home activities and extra space for the kids really add a nice experience for everyone as well as the ease of skiing in and out from the home. We look forward to welcoming you back to Big Sky soon! Beautiful house with exceptional layout for up to three families! Quiet location. Everything you need! Thank you for taking the time to give us your feedback. We are so happy to hear that you enjoyed your stay in our Powder Ridge Cabin 1C Red Cloud and it was ample space for your families! We look forward to welcoming you back to Big Sky in the future!